These are durable, hard-wearing mitts knitted in Rowan Pure Wool DK. The rib is the same as my Cave Pearl beaded mitts but with no beads. Instead, there are rows featuring bobbles at the wrist and the top. They have a fully fitted thumb with a lace side detail. I love mine and have knitted two pairs in different colourways. 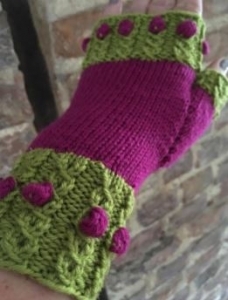 They may be hard-wearing but they are really fun to wear, and fast and easy to knit. I give you extensive notes on sizing them down too, as I think they would make lovely mitts for children. I specify 2 x 50g balls of Rowan DK, in 2 shades but you can in fact use left overs and knit random stripes and random bobbles.